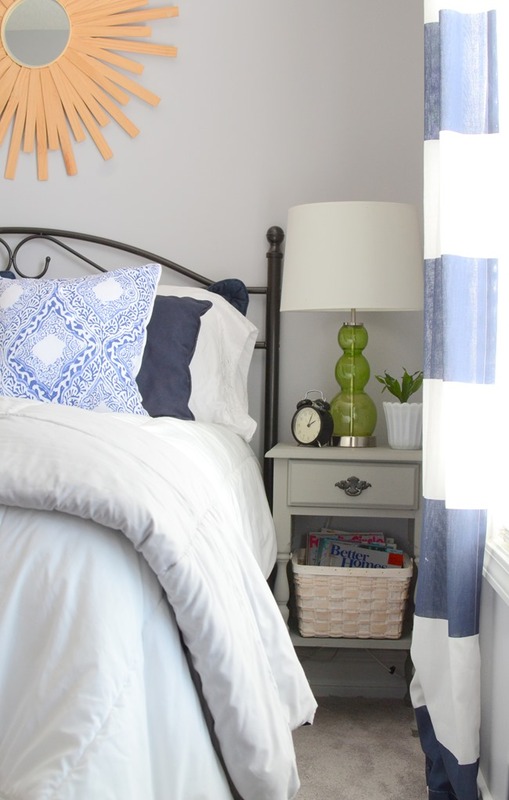 Well I am officially calling phase 1 of the guest room DONE! 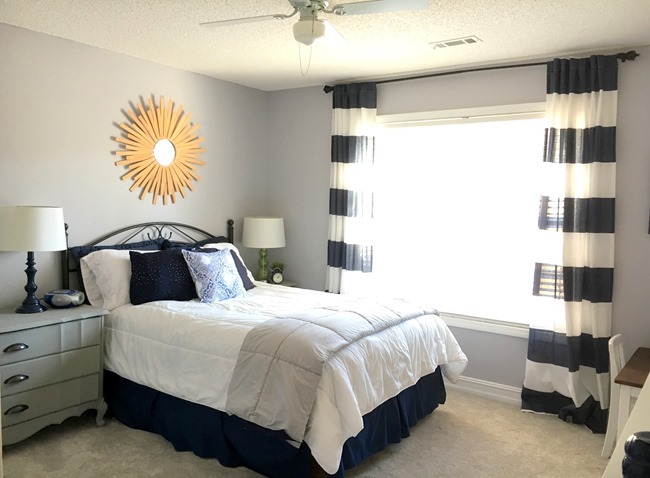 There is still several things I eventually want to tackle in here in phase 2– new fan/lighting, an accent wall behind the bed, new paint on the wall, and some better art but for now it is put together, pretty, and functional enough that I feel like I can have guests stay here. And way better than the way it was when we moved in. So let’s take a tour and then I’ll show you the before and after at the end of the post. For now I hung my $4 DIY sunburst mirror over the bed. And I found a pair of curtains on clearance at TJMaxx for $15 that work well in here. 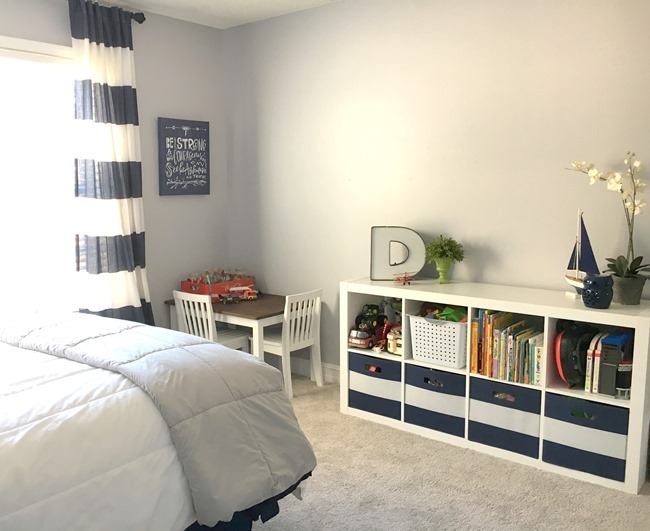 You can see the kids farmhouse table that I recently refinished in the corner. 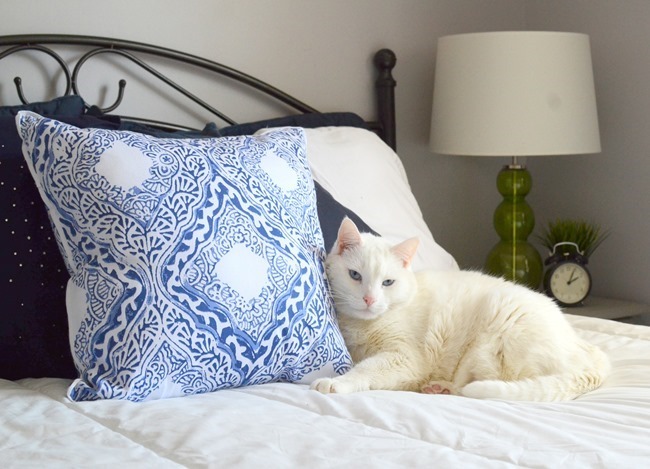 The blue and white pillow was a recent Goodwill find – still looking for maybe a few other blue and white pillows to replace some other ones on the bed. 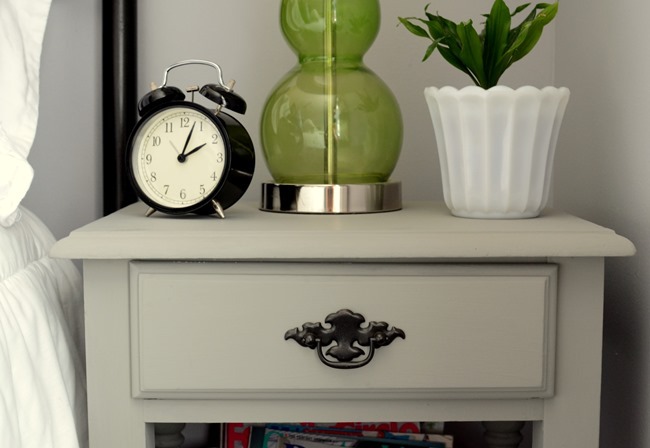 This refinished painted nightstand works so well in here! I just love it. 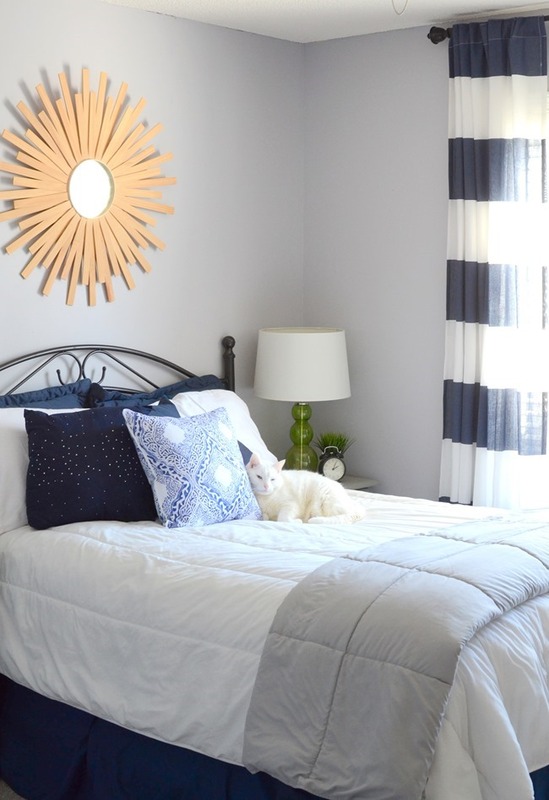 I want this room to have a bit of an industrial farmhouse feel and it is definitely getting there with gray furniture, dark metal bed frame, and white bedding. 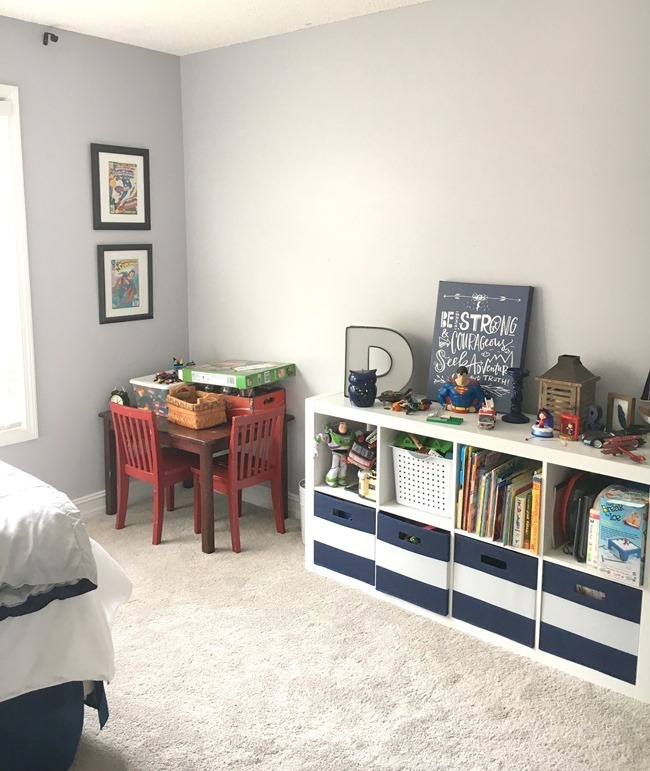 Here’s the other side of the room – a BHG cubicle unit holds lots of toys and books while still looking pretty in the room. 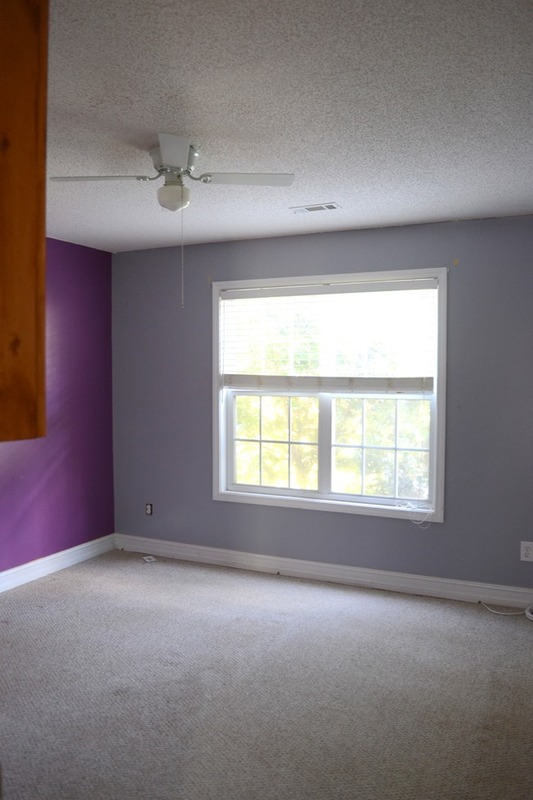 So let’s go back and see the before – this is what the room looked like when we bought the house. And how it looks now! Other than the curtains I didn’t buy anything new for this room. 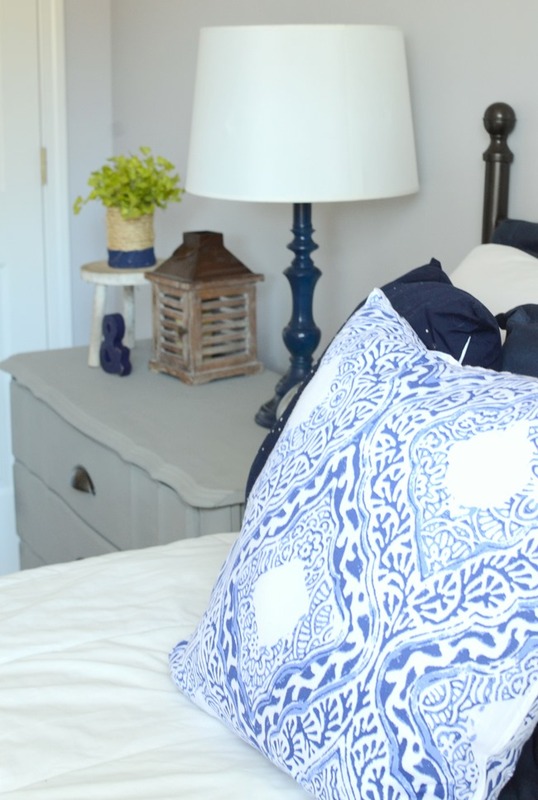 I painted a dresser, painted a nightstand, repainted the headboard, and rearranged and redecorated the room using things that were already in the room or that I had. And how it looks now. Once again, I just hung the curtains, painted the table and chairs, redecorated, and cleaned things up a bit. My cat is surely enjoying the room in between guests and my nephew using it. There is a bird feeder hanging right outside this window and he loves to take his nap on the bed while bird watching between snoozes. Your updates make the room look fantastic. You did a great job. Such a pretty room! You really did a great job (as always). Your kitty is adorable. He looks so cozy there. I love the sunburst mirror. 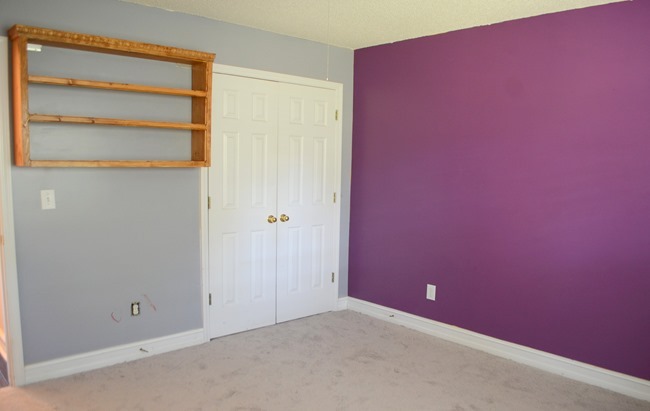 The color doesn’t work for me in this room. 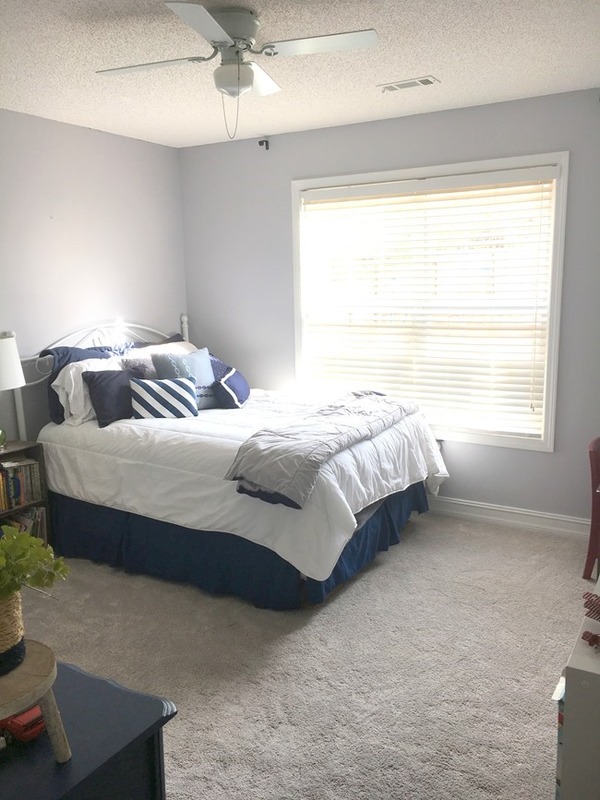 Would you consider painting it a dark grey, black or another complimentary color for this room. You rock. 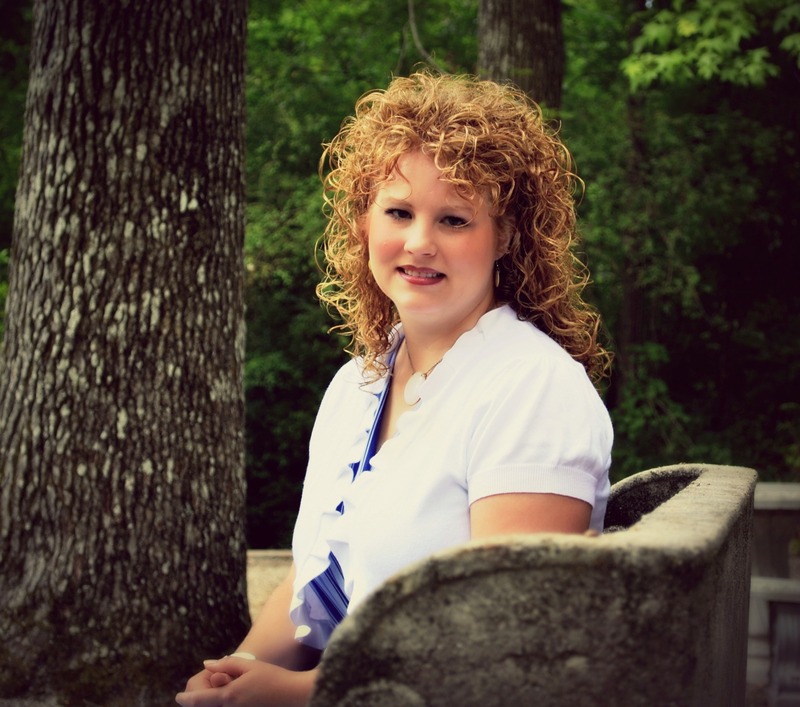 I love your style and blog. And this room is beautiful —as everything you do is beautiful!!! 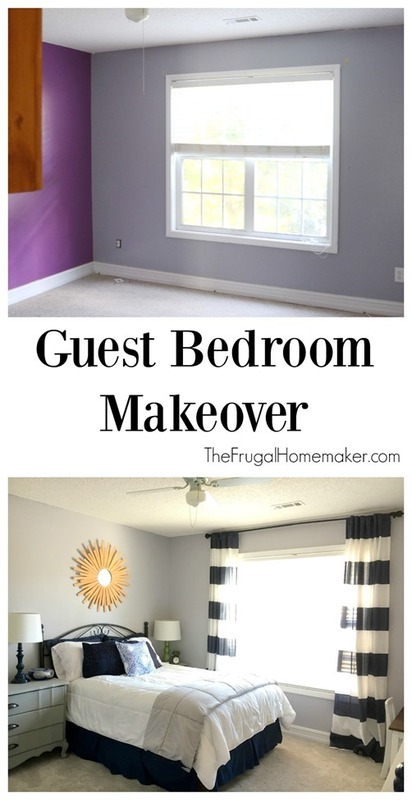 I love the transformation of your guest room…everything looks amazing! 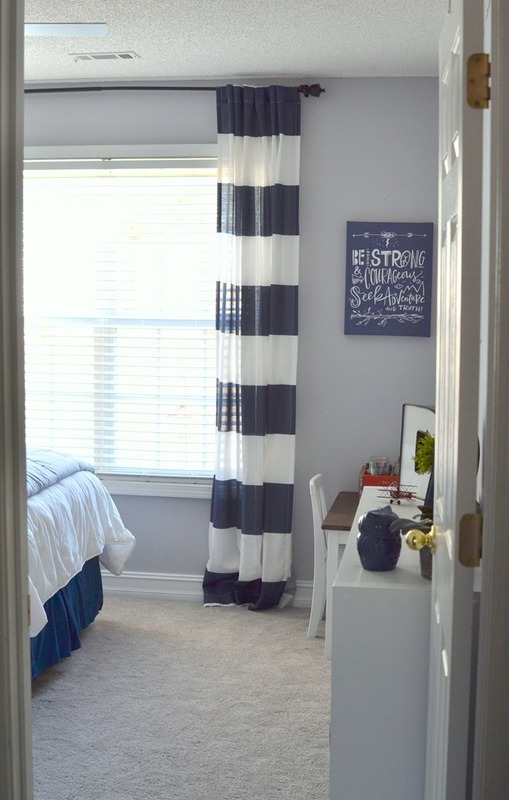 I think my favorite is definitely the curtains….they add so much to the room! Thanks for sharing – looking forward to seeing more of your great ideas. Blessings…..
Beautiful room…. 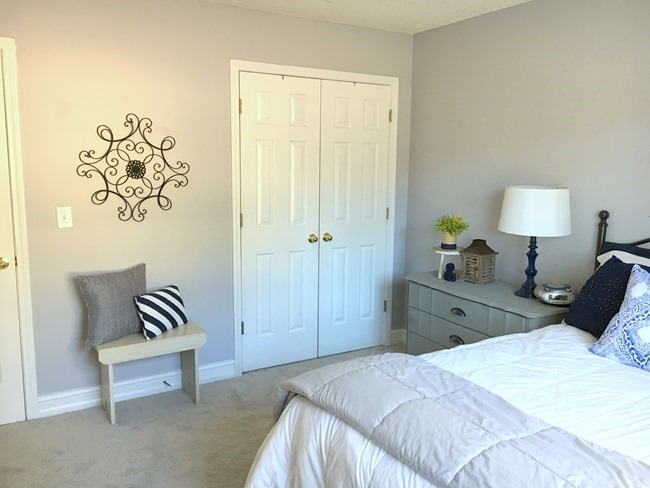 what is the paint color on the walls? The bedroom is definitely looking great. Everything is matched perfectly and I want to hug your soft kitty.